A disk Image is a template used to create virtual disks and quickly bootstrap ready-to-use virtual servers. A disk image usually contains a pre-installed operating system and a set of post-installation scripts, which are responsible for an automated configuration of the operating system, services and applications. In the upper right corner is a button labeled Show All, which can be used to display all images, including images that are not associated with the current working virtual data center. When creating virtual servers from disk images, it is possible and often required to assign parameters (metadata) to virtual servers, which can be used by a virtual server for its configuration during server’s initial start or other purposes. Alias - User-defined name of an image (usually displayed in the GUI). DC-bound? - Whether a disk image is bound to a specific virtual data center. Size - Minimal virtual disk size required by a disk image (read-only). ok - Image is ready to use. pending - Image is being created, updated or deleted. A disk image can be created, updated or deleted by a SuperAdmin or by a ImageAdmin (DC-bound image only). A disk image can be created from a snapshot of a virtual server or can be imported from a remote location. The import operation can be performed only by a SuperAdmin or a DCAdmin user with ImageAdmin and ImageImportAdmin permissions. An image used by at least one virtual machine cannot be deleted. However, its Access attribute can be changed to Deleted, thus the image will be hidden and unusable for new virtual servers. Management of server images is related to the VMS_IMAGE_VM global setting. With no image server configured all operations will be performed at database level only. Creating an image from a server snapshot is thoroughly explained in a separate chapter dedicated to virtual server snapshots. Used for associating an existing disk image with a virtual data center. This operation can be performed only by a SuperAdmin. In order to remove an association of a disk image with a virtual data center, the image must not be used by any virtual machine within the virtual data center. This can be performed only by a SuperAdmin. A disk image can be imported from a remote location. The import operation can be performed only by a SuperAdmin or a DCAdmin user with ImageAdmin and ImageImportAdmin permissions. An image manifest URL (with IMGAPI metadata about the image) is required for the import operation. A disk Image Repository (a.k.a. 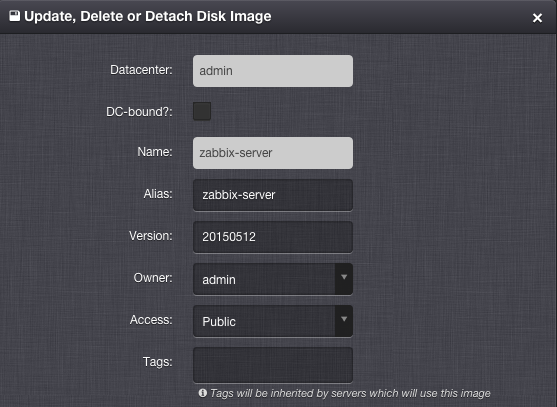 ImageStore) is a remote server location with disk images available for download. It has to implement the IMGAPI endpoints for listing and downloading image manifests and files. Disk image repositories can be configured by modifying the VMS_IMAGE_REPOSITORIES global setting. After the image repository is properly configured and loaded, one can browse through all available images and import them onto the internal image server. If a global image server (VMS_IMAGE_VM) is configured in the system, the image repository list will automatically include a local repository named after the image server. This functionality is available only to a SuperAdmin and can be used to import manually created images (i.e. images converted from other virtualization platforms), which were placed onto the image server by hand.